The remake has very little in common with the original, aside from being about a young orphan named Pete who is companions with a dragon named Elliot who is sometimes invisible. This has its upsides and downsides. There's little point in a remake that simply retreads the original. At the same time, it feels a bit silly to even call this movie a remake. 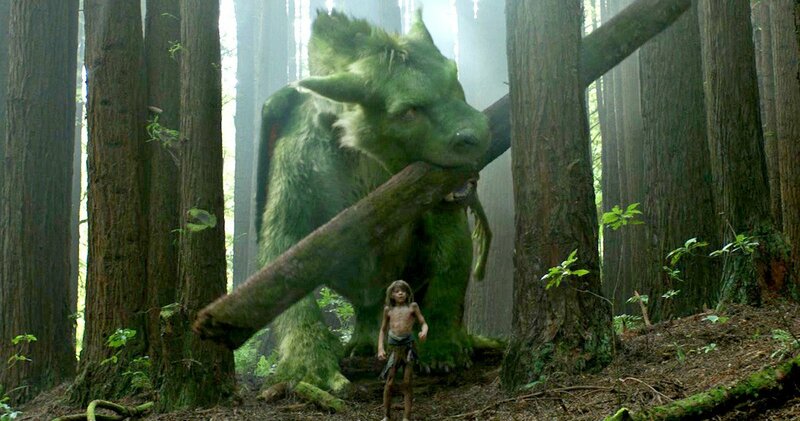 The new Pete's Dragon starts with a rather wrenching car wreck that leaves Pete an orphan. The camera stays focused on Pete during the actual wreck, but it is still a harrowing sequence. Young Pete is left stranded in the woods near Millhaven, Oregon. His only companionship for the next several years is Elliot, the dragon who helps him survive. While this avoids comparison with the original, it invites comparison to both Tarzan and the Jungle Book, both of which had new movie versions come out this year. Pete returns to civilization when a logging operation brings people close enough for him to encounter a kindly park ranger, Grace (Bryce Dallas Howard). What follows is a fairly predictable tale of finding family that builds up to some explosions for the finish. The story feels very by the book. 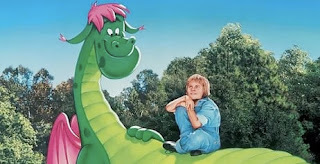 However, Pete's Dragon isn't devoid of flair. The film was shot in New Zealand, and the sweeping vistas of endless green forests make a silent but powerful case for the movie's environmental message. The soundtrack might not have the inimitable Helen Reddy, but it does have a lovely folk tune woven throughout that will worm its way into your head. The cast is game, from Wes Bentley and Karl Urban playing two brothers at odds to Robert Redford as Grace's father. Oakes Fegley (Pete) and Oona Lawrence (Natalie, a new friend) both do a wonderful job of interacting with Elliot and making it seem as if a dragon were really on set. 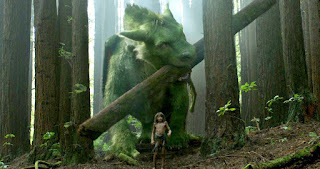 Don't go into Pete's Dragon expecting a retread, but don't go in expecting something staggeringly original either. Go in expecting a beautiful film with strong performances that is suitable for most of the family. (Some sequences might be intense for very young children.) I don't think my sister will be heartbroken. I've never seen the original. I like that it doesn't just recreate the same movie, but I can see how that might bother some people. Seems like a good one overall.